Solvent evaporation depends on parameters specific to each solvent, plus air temperature and velocity. A simple model gives an evaporation time for a chosen thickness of solvent, a more academic model lets you see how the quick model works. Now the more academic app which shows in more detail what is going on. The calculation method is the same, but for simplicity the quick model assumes that L=1000. We often need to know the evaporation rate of a solvent on a flat plate with a steady air flow above it. This is rather difficult to calculate from first principles, but some well-known approximations are good enough given the uncertainties in, say, measuring the rate. A few details remain. The air properties assume dry air - the calculated evaporation rates for moist air are not significantly different at this level of approximation. 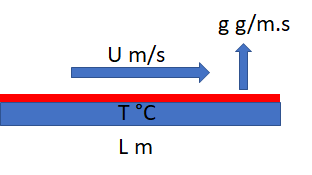 The kinematic viscosity of air changes with temperature; a simple polynomial is used to calculate it. The diffusion coefficient of the solvent in air can be calculated from T, MWt and the molar volume, MVol via a formula not shown here. The solvent values of MWt, MVol, AA, AB, AC are extracted from the values shown in the combobox for each solvent.